A couple of months ago the yarn shop I work at started carrying self-striping yarn. The morning Amy, the owner, pulled the yarn out of the shipment boxes was unreal. The customers (and, ahem, some of the staff) were RUNNING to the boxes and grabbing the hanks before we could put price labels on them! It was the first time in recent history that we've carried striping yarn and let's just say everyone was a little excited. Project: Getting Back into Socks, Socks! Because it's been so long since I've knit socks from the cuff down I forgot how much I hate the regular long-tail cast on for socks. If I knit anymore cuff-down I'll need to remember to use a more stretchy cast-on method. And for some reason my first sock was super loose, I think I had an issue with my tension. Very odd. The second sock fits well. These were initially for my mom but the second sock won't fit her so these are now for me. (oops!). 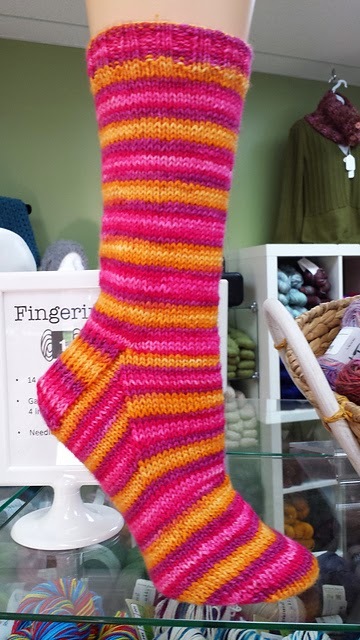 As for the sock yarn... it is nice. At 80% merino + 20% nylon blend, it's my favorite type of sock yarn. The fact that it stripes is just super fun. Sure I could have done something more interesting for a pattern but I have a couple students wanting to try socks for the first time and because it's been so long since I've knit plain-vanilla socks I figured I should have a go and practice. Besides, the simple sock really does make great metro knitting - easy to stop and pick up at anytime. Watch for more socks in the next couple of months! Anyway, YOUR socks look lovely! After saying for years that I would never be a sock knitter, I have recently come to appreciate socks. They really are great travel projects, and the knitting can be as simple or complicated as you like. I love the sock. I'm a sock addict--have more socks than I need, and even after having knit over 100 pairs since I started about 17 years ago, I never get tired of them--like to make vanilla ones best. 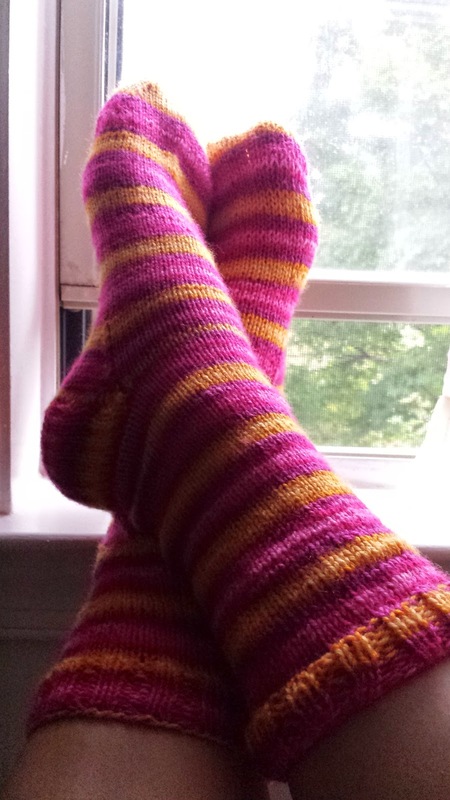 When I first discovered sock knitting with self-patterning yarns, I would come to school every Monday morning and my 6th graders would want to see my latest socks. @Melissa - I did not know about the hoopla surrounding the Cici & Biscotti yarn (I love the Knitmore girls but my ipod busted several months ago and I have not been a regular listener since!). Very interesting and thank you so much for pointing this out to me. I plan on doing a little test swatch with my left over yarn. I can post my findings in an upcoming post. Thank you!